With cold and flu season fast approaching, we’re about to start the long and difficult battle against nasty bugs and germs. Hands are the main pathways of germ transmission, with 80% of common infections being spread by hand. The advice you’ve probably heard dozens of times from your doctor (wash your hands throughout the day) really does prevent infections. But, washing your hands constantly isn’t always convenient, especially when you’re on the go or busy at work. Hand sanitising is effective for people with demanding lifestyles; it is one of the easiest and quickest ways to remove germs, avoid getting sick and prevent the spread of germs to others. There are pocket-sized sanitisers on the market that you can carry with you, ensuring you are equipped against germs at all times. Hand sanitisers kill 99.9% of bacteria in seconds, so they truly are an essential and effective product in the battle against cold and flu. If you are someone who gets migraines triggered by smells, a lack of chemicals or masking after-smells is a massive benefit, so always opt for a chemical-free hand sanitiser. These products should not contain any Parabens, Pthalates, SLS, Triclosan, preservatives or fragrances. If you are concerned about triggering allergies, purchase a sanitiser that is endorsed by Allergy UK as an ‘Allergy Friendly Product’. Many people suffer from dry hands, sensitive skin and Contact Dermatitis, especially during winter, so choosing an allergy-friendly product is imperative as it can be used on the most delicate skin and won’t cause your skin to dry out, even after repeated use. Sanitising water is also a fuss-free way of keeping germs at bay. It can be sprayed onto the hands, and onto household and family items such as bottles, dummies, spoons and toys and is clean and safe for use in the home or on the move. In addition, sanitising water can be used to cleanse surfaces easily and efficiently, keeping tables, worktops, desks and work areas germ-free. 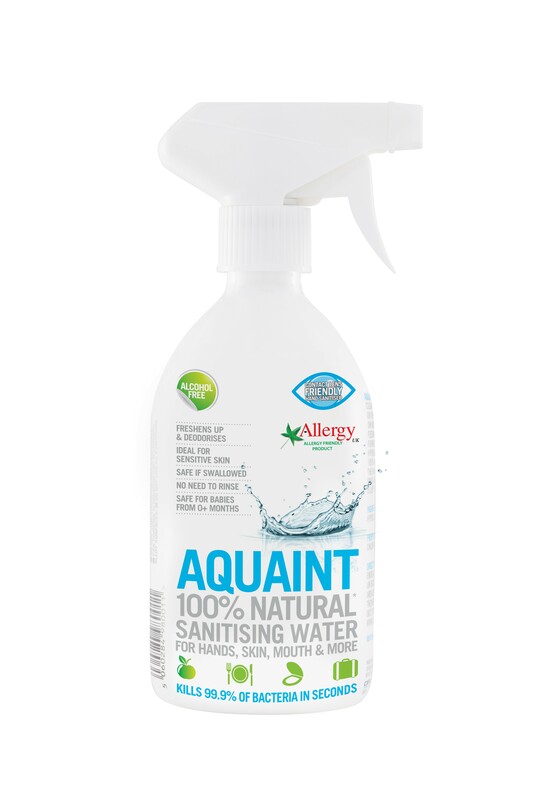 Aquaint’s multipurpose sanitiser spray doesn’t leave any residue, so you won’t even need to wipe surfaces after use, saving you both time and energy. You can keep yourself and the whole family protected from the spread of cold and flu with this method.